The Preparation Center for Languages and Mathematics (PC) has brought 92 new students into the PC and MP Programs in Quarter 4/2018, making up 400 local and 20 international students this quarter. From last PC quarter, some exceptional students have been granted various awards for their academic endeavors and contributions to PC. 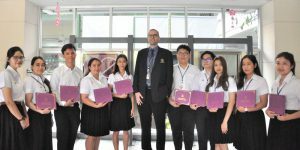 Presented at the recent PC Student Orientation by Dr. Alexander Nanni, the Best PC2 Term Project award went to Mr. Thanaphum HONGPHAKDEE, who produced an excellent news video regarding a social issue in an ASEAN country. Moreover, the other student, Ms. Chotirod MAMUANG (PC2), also received a special award for her exemplary academic achievement throughout Quarter 3/2018. PC wishes these students the best in their academic endeavors and in the next step at MUIC.